As an author I’m particularly critical about travel books, as I know what kind of in-depth research it takes to produce a good one. 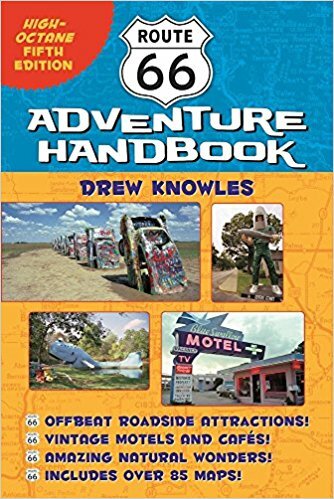 And gladly Drew Knowles does too, as his Route 66 Adventure Handbook is an excellent resource for anyone who wants to explore the Mother Road. And I have to add, that as a frequent traveler along the route. I’m also very impressed with the details that Knowles included in his “high-octane” fifth edition. He points out often-missed sights like El Garces in Needles, CA, the U Drop In in Shamrock, Texas, and a quirky mural in Sayre, Oklahoma. But of course he also mentions the popular stops such as Cadillac Ranch in Amarillo, Texas, the La Posada Hotel in Winslow, Arizona, and (one of my favorites) the Route 66 Auto Museum in Santa Rosa, New Mexico. Even better, GPS coordinates are included for most of the photos in the book, so you’ll be able to see exactly what the author saw. And it’s all organized by state, so it’s very easy to follow when you’re on the road. Add in lots of cool photos, a bevy of maps and even some nearby attractions and you have an excellent Route 66 resource. Although there aren’t any access details included in this book, that’s not really what it’s about. Plus you can see the lion’s share of Route 66 from the comfort of your car, and this book tells you how to do that. Trust me, you’ll get some great windshield views along the way! I only wish I would have had this book 20-some years ago when a rookie PR person took us on (her first) Missouri Route 66 tour. It would have saved us a lot of time and anguish, as some of the Route 66 stops in that state were difficult for us to find — but with Knowles’ book it would have been a piece of cake. Bottom line — if you plan on exploring Route 66 get this book. You won’t be sorry! This entry was posted in Book Reviews, Road Trips and tagged book, driving, resource, road trip, route 66 by Candy B. Harrington. Bookmark the permalink.